There was a thirties Maroon Humber Sedan with one of the studios in Hyd that was used extensively for movie shoots. The roof was chopped and the brightwork painted golden. It was a common sight on the roads but I don't know what movies it starred in. Shyam....have you seen this car ? Also there was said to be a good sized car collection at Ramoji Rao's studio, does anyone know about them ? New Delhi: Born on December 29, 1942, as Jatin Khanna, the actor was raised by the relatives of his biological parents. He attended St. Sebestian’s Goan High School along with his childhood friend Ravi Kapoor, who later adopted the screen name Jeetendra. Always high on confidence, Rajesh Khanna was the other name for style. He approached filmmakers in his own MG sports car during his struggling days. 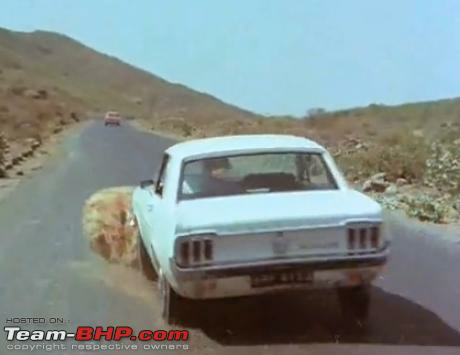 Oh Rajesh Khanna had some of the best cars. 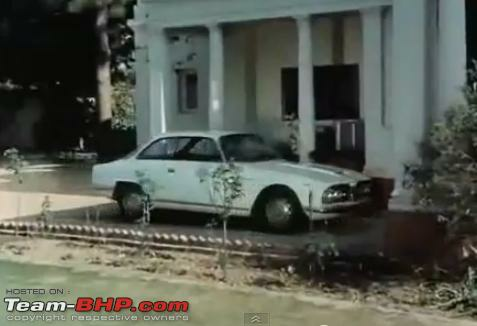 I think there are pics of his cars scattered around the forum including the W115 coupe. Indeed a very sad day! The superstar is gone. Wish he lived for many more decades to tell the future generations how a SUPERSTAR, PHENOMENON and ADULATION can generate MASS HYSTERIA like never before. I am sure he was unique! Among his later movies AVATAAR with Shabana Azmi is a great film. His car sense was excellent. He gifted a Lotus to his wife Dimple sometime in 1974. He also owned a white Standard Herald (was his first ever car probably with his own earning) to which he was very attached. The car was with him for many years and maybe even now! Last edited by anjan_c2007 : 18th July 2012 at 19:41. Here are two videos from Rajesh Khannafilms. One features him in Chala Jaata Hoon from Mere Jeevan Saathi (1972) set to tune by R.D. Burman. And this one shows him zooming around in a Bullet with Hema Malini in Andaaz (1971). The song is set to tune by Shankar Jaikishan. Both the songs are sung by Kishore Kumar. Recently I got this photo, Rajesh Khanna in a movie. The timing was a bit eerie, got it just a day before the sad news. The movie was Maha Chor, with Neetu Singh and Prem Chopra, Narinder Bedi produced and directed the movie, music was R.D.Burman. All this info was stamped on the back. And the car, an MG C? Definitely a 'Spridget' - an MG Midget or Austin Healey Sprite (both essentially the same car I believe). Those wheelcaps make think more likely to be Austin, but cannot say for sure. This is an MG, he owned this car. Recently I got this photo, Rajesh Khanna in a movie. And the car, an MG C? Although I think it's a Sprite (and I know RK drove around in an MG those days), it would've been easy to tell between an Austin and MG if Rajesh Khanna weren't covering the exterior door handle - the Midget of this model didn't have any! Interesting to notice the lady's sneak peek though (Aruna Irani?)! Edit: OT, but did Rajesh Khanna copyright this pose?! 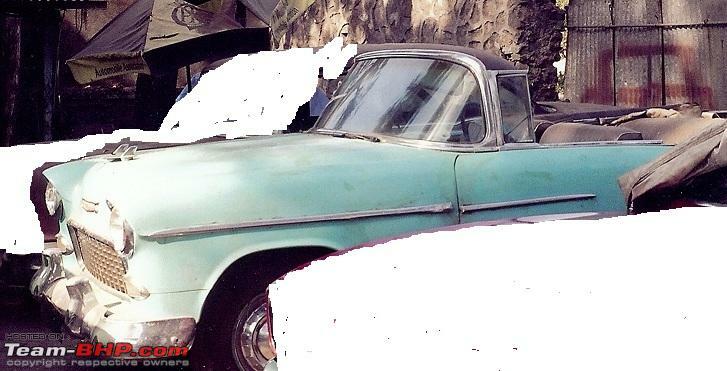 Edit again: No, on second thoughts, I think it's an MG, because the Austin probably didn't have the side beadings, eh? Last edited by Prabal : 27th July 2012 at 00:47. Film Trishul, Starring Amitabh and Shashi Kapoor, featuring Alfa Romeo and Jaguar E Type Chevy Impala 1960 Convertible I remember they were Delhi registration cars. Film Adalat, Starring Amitabh Bacchan in a Double role. They crashed this Mustang mercilessly. I clearly remember the Trishul cars, including the red Herald from Gapuchi gapuchi gum gum . If I remember right the Alfa was registered DHT 14, and we couldnt see the Jag registration. Wonder if it survives, with or without the supercharger! 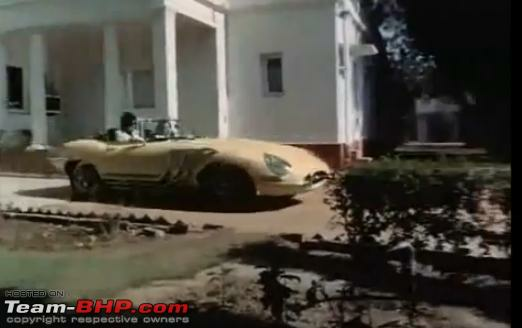 This song (9.34 minutes long) is from "Hanste Zakhm" (1973), where hero Navin Nischal is seen driving the Fiat taxi. Heroine Priya Rajvansh is the passenger. The car traverses through many parts of Bombay. The song is melodious too and is set to tune by Madan Mohan (lyrics Kaifi Azmi). In a brief moment one could see the Jag..I believe it was DHD or something like that. Just a flash. This song is a composers delight and a singer's nightmare. Great composition and very difficult to sing. Mohd. Rafi was a maestro who could manage it. This movie had a few songs all of them were super hit songs. Incidentally my family were the distributors of this film and the world right controllers. Thankfully we do not do business with the film world anymore since the mid 80's. I was watching TV last night and saw I S Johar (in a Red buick Convertible early 40's..is it the same one used in 1942 a love story?) 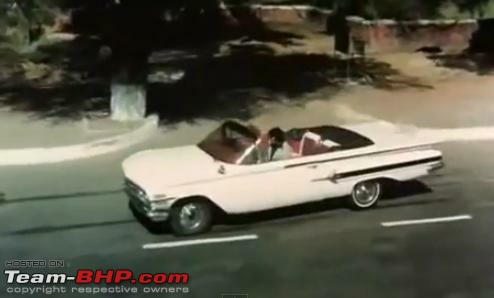 singing to a Sonia Sahani (in a convertible 55 Chevy Belair..MRZ 5858) wherein he says "Tum Impala me aur main Khatara mein" Shows the level of popularity enjoyed by the Chevy brand in those years. I forget the name of the movie, will try and dig it up. Found it.... from the film Johar In Bombay .. (1967) Heres the song. Also see the various Fiat Selects and Ambassadors in the background. Last edited by V-16 : 31st July 2012 at 16:35. Reason: Added Video.